The new edition is thoroughly compatible with the 5th edition of the Diagnostic and Statistical Manual of Mental Disorders. The chapters are complete unto themselves, allowing for easy retrieval and use by clinicians facing daily challenges in the field. Extensive references allow for further research and study in quieter moments. Chapters on specific disorders have consistent structures, where appropriate. For example, the chapter on "Autism Spectrum Disorders" has sections on background, prevalence, etiology, neurobiology, clinical presentation, assessment, differential diagnosis, comorbidity, research, interventions and treatment, and medication. The prestigious roster of contributors boasts both luminaries and emerging leaders in behavioral neurology and neuropsychiatry, providing readers with diverse perspectives. The material is supported by scores of tables, graphs, and illustrations, including PET, CT, and MRI images. Neuropsychiatry has come a long way from the days when patients with neuropsychiatric conditions routinely fell through the cracks of the healthcare system. 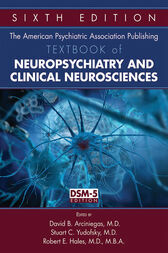 The Textbook of Neuropsychiatry and Clinical Neurosciences provides comprehensive, current, and evidence-based coverage in a forward-looking volume to train a new generation of clinicians in this important work. David B. Arciniegas, M.D., is Chief Medical Officer at the Center for Mental Health in Montrose, Colorado; Director of Education at the Marcus Institute for Brain Health; and Clinical Professor of Neurology and Psychiatry at the University of Colorado School of Medicine in Aurora, Colorado. Stuart C. Yudofsky, M.D., is Distinguished Service Professor and Chairman and Drs. Beth K. and Stuart C. Yudofsky Presidential Chair of the Menninger Department of Psychiatry and Behavioral Sciences at Baylor College of Medicine; and Chairman Department of Psychiatry at Houston Methodist Hospital in Houston, Texas. Robert E. Hales, M.D., M.B.A., is Distinguished Professor of Clinical Psychiatry at the University of California, Davis School of Medicine.